The sun shone enchantingly, bright like a diamond – which was in consonance with the venue of this pertinent book launch, Kimberley the diamond city! And a memorable book launch it was. The occasion co-incided with ‘Woman’s Day in South Africa” (August 9), as bard Ricci Niekerk-Groenewald launched her first poetry book at the teeming Mayibuye Centre. Indeed in her book, laced with imagery, she writes about sundry topics like happiness, love, sorrows, and nature and all the things that inspire her to write and write more. Ricci also told the book launch attendees that her book is one that many can relate to; hopefully instigating all ladies to read and read more to broaden their knowledge of what is happening around them and afar. She was full of bliss and felt blessed to finally launch her book that she disclosed she actually wrote almost a decade ago. Sandy (Sass) Schultz said about the book (Things Unsaid): “It seems to be written in blood, raw and red, like the crimson that stains this sleeve. These pages cradle cries that echo from a wounded heart and speak to our understanding of human hurt”. The day was celebrated in style and woman in poetry came together to support one of their fellow poets. Poetesses like Ntombi Kayise, Lynthia, Siza Nkosi and Nosipho recited their poems based on women’s experiences and articulations; many felt that it was a proper day to acknowledge the vital role of women in the various societies and household. It divulged that women can do many things on their own. Gontsewa Chaane was the innovative master of ceremony. 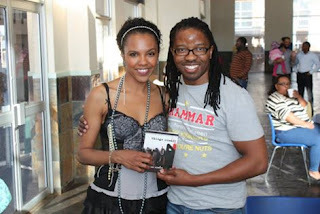 Among other artists that were present at the “Things Unsaid” launch, included the illustrious Sabata Mpho Mokae (with the author, above), Maruping Phepheng, Moses Nzama Khaizen Mtileni and Siza Nkosi. The book ‘Things Unsaid” was published under The Ink Sword Publishing Company based in Kimberley. Ricky Groenewald, one of the co-founders of Ink Sword expressed his gratitude to everyone who attended the book launch, and inspired everyone to read and write because “you can’t write if you can’t read”. He also revealed that the goal of Ink Sword is to publish many writers writing in different languages in South Africa, and the entire World. Ricky added that “Things Unsaid Book” is one of the twelve books that the Ink Sword has published since its inception almost two years ago.